Our healthcare business intelligence dashboards helps to track and improve daily operations and reduce patient waiting time. Healthcare providers need proper alignment in day to day operations. Work that comprise of entering and maintaining proper patient record (EHR), quality patient administration, regulatory compliance for maintaining required standard of care and other processes.All these processes needs to be in proper sync to produce better outcome. These processes can be benchmarked and replicated to other departments to track improvements. Success of these critical operational factors can be accomplished by having a clear and real time visibility into information gathered from different sources. With EzDataMunch’s healthcare business intelligence dashboards, clinicians and administrators can get accurate and real-time insight into their day to day operational metrics and KPIs. This insight can help users to understand areas that can be enhanced to increase the efficiency of procedures, reduce patient waiting time and deliver quality care. Our healthcare business intelligence solutions helps to analyze patients length of stay by speciality, age, ethnic group and admission description. Put patients to the right care, right bed and right nursing to ensure appropriate length of stay and smooth patient flow. Track patient progress daily and complete other activities like payments and discharge in timely manner. 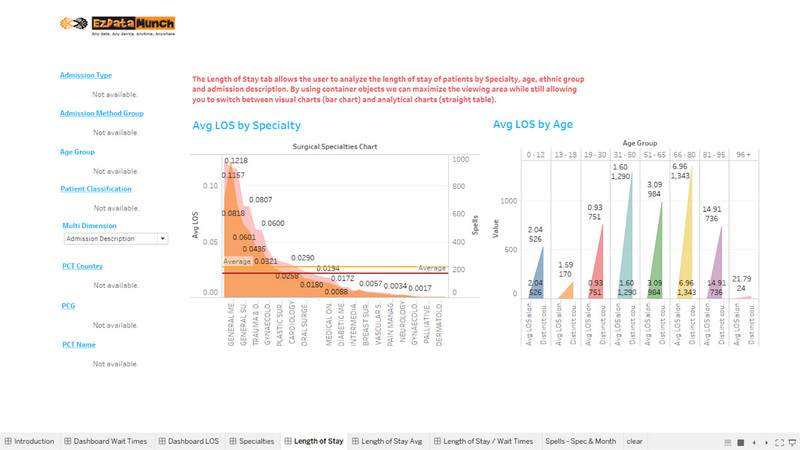 Manage capacity by knowing the daily average of scheduled or unscheduled patient’s admission. Patient satisfaction and positive outcome depends on the time taken to diagnose the patient. Every patient needs to be diagnosed in appropriate time irrespective of the disease. There are many touch points between patient entering the door till diagnoses and then treatment process and finally, discharge. With the help of our healthcare business intelligence solution business users get detailed insight into the waiting time and healthcare providers can improve the quality of care. This data can help expedite the treatment time based on severity.Users can categorise disease, schedule appointments, plan resource utilization and ensure patient satisfaction. 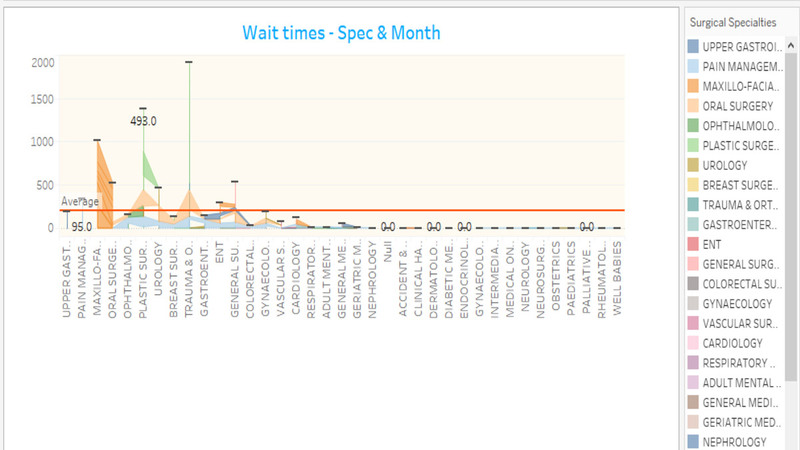 See the average wait time based on specific ailment group, ethnicity and classification. 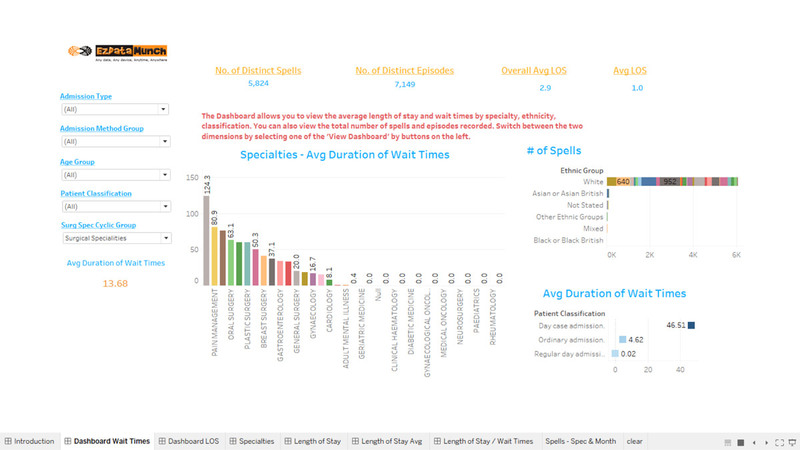 See the total number of spells and episodes recorded. Filter the report based on parameters such as age, admission method group and admission type. 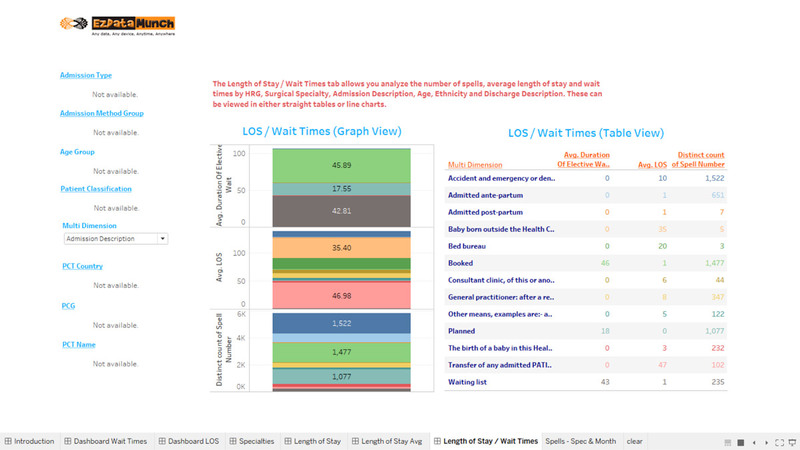 Analyze wait time and spells by Healthcare Resource Group (HRG) and specialities and compare the wait time with previous months data. Scheduling patient visits at the right time and with the right consultant goes a long way in ensuring patient satisfaction and timely diagnosis. Inefficient scheduling system can lead to patient dissatisfaction and frustration for referring consultant. With our healthcare business intelligence dashboards business users can analyze the number of patient, visits and compare the data with total volume of visits per patients as per week, month and year. Filter the data as per location, age, gender and diagnosis to understand which cohort visits often. Check whether the appointment has been completed, rescheduled, active, canceled or no show and further filter this data based on diagnosis type. Healthcare providers are under pressure to reduce cost. To achieve this goal, care providers have turned to drive greater efficiency from their most valuable resources. These resources are doctors, nurses and other supporting staff members who are involved in delivering care. Business users need real time and quick information into various KPIs like number of patient, productive hours, over time,and full time employees per occupied bed, to increase efficiency and bring down cost. With our healthcare business intelligence solutions, users can measure the performance by analyzing labor data gathered from different branches, regions and shifts. Uncover best practices and point out areas of improvement by comparing data gathered from multiple hospitals and departments. Analyze planned budget against actual spending by comparing multiple metrics like FTE/OB. Analyze productive hour against actual productive hours achieved and over time data to deduce costs. Drill deeper into over time variance reports gathered from different branches to understand the reason for overtime and identify low performers.